Designed to be a "no frills" music option for all types of events ! PoddMyParty is a DIY rental service that allows the client to have total control over their own event. For $325 per day, or slightly more, all your music is in your control. This is a "no frills" service where a small and efficient system with powered speakers and a Mixer allows playback of your music from a variety of digital devices you. Now PoddMyParty can do Bluetooth also! The PoddMyParty system is simple to use with a smartphone, laptop, tablet, any portable digital device, or a CD full of .mp3 files! Any portable digital device can be used with Bluetooth or by directly plugging it in! And more than 1 device can be set up at one time. You can have YOUR music and YOUR playlists for the event. Anyone can plug in their digital device during the evening. There is even a microphone included for announcements that need to be made, and a wireless microphone is offered as an option. Use PoddMyParty for any event! You can use the PoddMyParty system for small weddings, graduation parties, fundraisers, charities, block parties, reunions, gatherings and more! Listen to "Your Music, Your Way", on your timeline. We provide the portable system/equipment, you provide the music ! In today's digital age, everyone has music on their personal iPod, Smartphone, Laptop, or Tablet. PoddMyParty is not just for an iPod it's for any digital source. Your music is portable, so let's put it to use for your next party ! Maybe you are just having a small reception or friends over to the house. Or maybe you're having your wedding up at the cottage, or on a lake. Or, maybe your DJ is a friend flying in from Alaska... all he needs is his laptop with PoddMyParty! Many times parties are on the small side, at a family home or park and no large budget. Wouldn't a great sound system just make it better? This is an alternative to a "full service" DJ or sound contractor. There are events where this can offer exactly what the client is looking for at a reasonable, low cost rate. Easily transport the Podd to different locations for the same event! Our P.o.d.d. (Personal On Demand Digital) systems are engineered with our clients in mind. They are small, light and easy to transport, set-up and use. Each Podd is free standing (no tables), pre-wired (less cords), and takes less than 15 minutes to set up. It transports in 3 nylon bags, 2 speakers, and 2 small carrying cases. Best of all it will fit in the back seat of a car and it is totally under your control. Looking for an Award Winning Full Service DJ? We will provide you with the creativity, experience and originality to make your night a celebration! "The rental of the "Podd My Party" was better than what we expected. Dealing with Joe was very easy, he took as much time as we needed explaining everything. Very accommodating for the pickup and return of the equipment. When we picked up the equipment, he time explaining everything and we hooked it all up to verify. The usage of the equipment was very easy to learn, we had no problems setting the equipment up and using it during our event. The quality of sound and volume was very good." 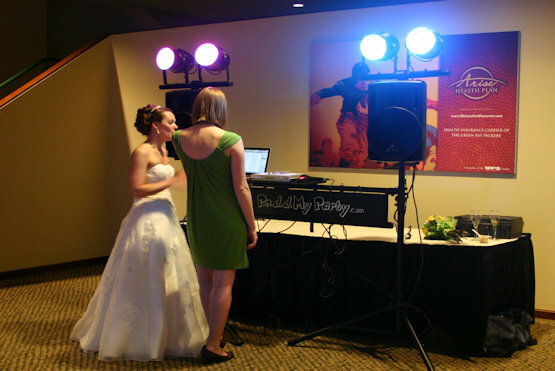 "PODD my Party was great for our Lambeau Field wedding! We were able to move the system quickly and play music for the ceremony and the reception. We wanted lots of Packer music which is exactly what we were able to do. Everyone enjoyed being able to request songs and play what they wanted to hear. It was easy to set up and take down and the owners were very accomodating, even letting us pick up the system the night before to rehearse. I would definitely use PODD my Party again in the future!" You can also add the wireless microphone option to the standard rental w/o lights for $25. Add $50 to any rental for extra days. As shown above - includes tripods, cross bar truss, and shelf. Uplighting Design Changes The Atmosphere! Uplighting. Subtle, ambient, or dramatic. Rich colors to soft pastels. Head tables, ballrooms or architecture. 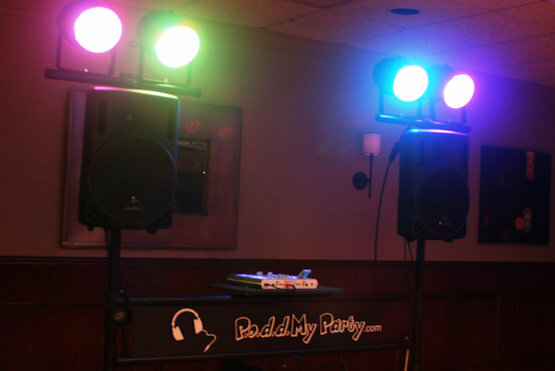 PoddMyParty is a DIY DJ rental service for weddings, parties, and all types of occasions. From Green Bay to Appleton, Fond DuLac to Marinette, Sheboygan to Oshkosh including the Fox Valley and all of Northeast Wisconson. 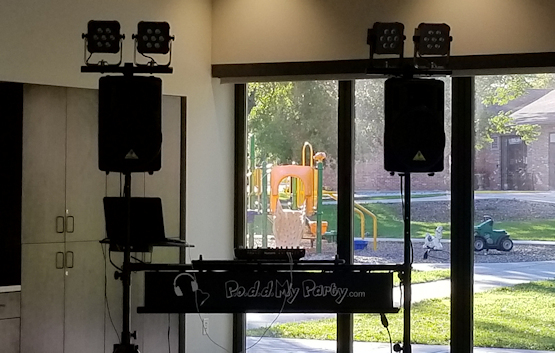 Based in Green Bay, the PoddMyParty rental can provide you with DIY DJ service for Parties, Mitzvahs, Weddings, Company Events, Picnics, Class Reunions and more! Legally, PoddMyParty cannot provide music with a rental system. However, it works with any of your digital media you provide - - iPods, smartphones, laptops, tablets via streaming or playlists.